The recommended franking machine for 100 items / letters a day. The Pitney Bowes SendPro C200 franking machine has many useful features that make this machine such a catch to have. It will frank all mail perfectly with a clean and clear franking impression every time, helping you to improve your professional image. Take full advantage of the SendPro C200 machine today and benefit from all of the useful franking machine benefits and features. 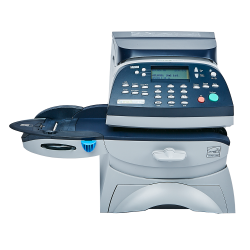 The Pitney Bowes SendPro C200 franking machine is a low volume franking machine suitable for any small business that is growing quickly. It can frank up to 100 items a day, meaning any small business will be able to get on top of the mail load easily and quickly. It is ideal for any business moving on from an entry level machine or have just started to frank. Why choose the SendPro C200 franking machine? IntelliLink is integrated into this franking machine, and make the most of it by connecting to a secure LAN connection via the internet. Gain access to faster services such as postal tariff changes, software updates and envelope messaging – all of which can be downloaded quickly and effortlessly to your franking machine. Also benefit from using the latest technologies that are also integrated into the machine. Fast & Accurate Postage Re-crediting! Update and replenish your franking machine 24 hours a day, with simple to use one-touch refills via Postage by Phone. This service is quick, secure and hassle free for your business. Get up to 55 days free credit with PurchasePower – post now, pay later. Enhance your business image and build a better brand by transforming the most simplest of envelopes into eye catching mail items. Use the Pitney Bowes SendPro C200 franking machine to frank envelope messages on to your mail items. Upload any envelope messages to the Pitney Bowes website and use it within a week. If you want to see the fantastic SendPro C200 in detail, view the video below and see just how easy the SendPro C200 is to use. There is a built-in 2.5 KG weighing scale with the SendPro C200. Protect the SendPro C200 franking machine via the use of PIN code security. This machine is Smart Meter compliant. Take full advantage of this unique service with the SendPro C200. Track expenses for up to 25 departmental accounts on the Pitney Bowes SendPro C200 franking machine. Automatically record and report any VAT paid via VAT applicable services with the SendPro C200. This Pitney Bowes SendPro C200 franking machine is Mailmark compliant, allowing you can use the New Mailmark service and its benefits. Use an analogue or LAN connection to recredit and update the SendPro C200 franking machine. Below you will be able to find all the specifications and options of the Pitney Bowes SendPro C200 that are available. We can guarantee that the Pitney Bowes SendPro C200 franking machine is a low volume franking machine available in the UK. It is a low performer, but perfect for people starting to learn how to frank. Compare the SendPro C200 against other low volume franking machines, and you may see that other frankers may be slightly more suited for your business. Increase productivity with the Pitney Bowes SendPro C200 and compare it to other low volume machines. Please take a gander at the table below.